Apple Seeds Cyanide: Do Apple Seeds Contain Cyanide ? Blog » Health Blog » Do Apple Seeds Contain Cyanide ? Do Apple Seeds Contain Cyanide ? Apples are supposed to be one of the healthiest and delicious fruits that we are munching on since ages. Because of the numerous health benefits that are attached to eating an apple everyday, the saying ” an apple a day keeps a doctor away ” came into inception. However, how would you react when you get to know that one of your favorite fruits, Apple is home to one of the most deadly poisons? Are you aware of Apple Seeds Cyanide – which has been taking the rounds recently on the internet? Have you ever come across those black seeds hidden deep inside the apples? These black seeds have an unhealthy story to tell. Where apples are recommended healthy and a must addition to your daily diet, the apple seeds are dangerous to health causing various disorders and death. Don’t worry, we will delve deeper into the question of ” do apple seeds contain cyanide or poisonous substances ” below and ensure that you stay healthy and safe! The apple seeds consist of a small proportion of chemical composite known as Amygdalin. This substance is not harmful as far as it is unscathed or swollen accidentally. Nevertheless, it takes a heinous turn on being chewed or crushed. It releases a harmful gas popularly known as cyanide that may lead to death if taken in high amounts. Due to this chemical named cyanide, apple seeds cyanide term has been born. The high amounts of Amgydalin consumed will certainly get you in a big trouble. A person is said to have taken a high dose of Apple Seeds Cyanide if he has munched roughly 200 black seeds of apples. Suffer from a heart failure. Body ache and other body related turmoil. Black seed oil, on the other hand, smells good and is favorable to your skin and hair. It can fight cancer and other diseases. You can get benefited to the numerous advantages attached to the apple seed oil but beware chewing the apple seeds cyanide. Also, read about: Foods to lower cholesterol and Home remedies for diabetes. Apples are undoubtedly good for health but if not eaten rightly, they can land you in misfortune. Keep your eyes and ears open so that you do not get trapped inside the uninvited accidents. It is always adviced to slice the apple into four pieces, remove black seeds from between and then bite on to avoid any mishaps. Alternately, if you are out and want to have an apple, go ahead but don’t forget to spit the seeds out. Few fruits like apricots, peaches and cherries have the kinds of seeds that can produce cyanide when exposed to chewing. If possible do carry other fruits along that do not have such harmful seeds. The seeds if coming in contact with your teeth will prove to be detrimental. Avoid giving the whole apple to kids, as they might not follow what it takes to be unharmed. Be safe be alert! And, don’t forget prevention of apple seeds cyanide lies in your hands. Takeaway: Do apple seeds contain cyanide? Yes! It’s true that apple seeds contain cyanide in the form of amygdalin, a substance that releases the toxins into the bloodstream when chewed and digested. However, you don’t have to worry about potential fatality as the amount of cyanide present in an apple that renders the consumption of an apple fatal is minimal. Therefore, consuming apple seeds in small amounts is not harmful as it does not contain enough cyanide to cause harm. 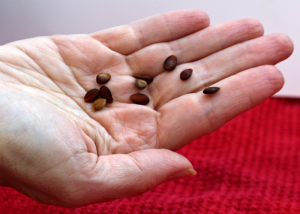 Nonetheless, it is safer and healthier to spit out seeds to avoid any potential issues.